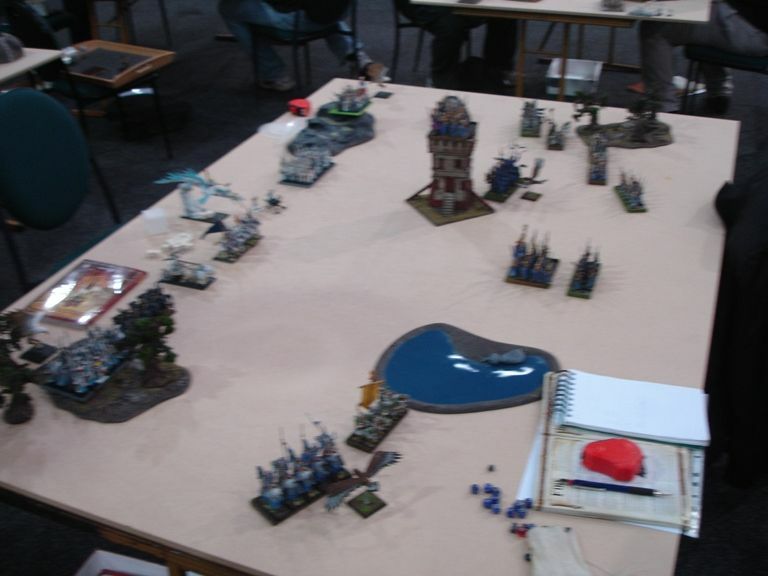 Second battle of the Wintercon tournament was Dawn Attack scenario exactly as it is described in the rulebook. 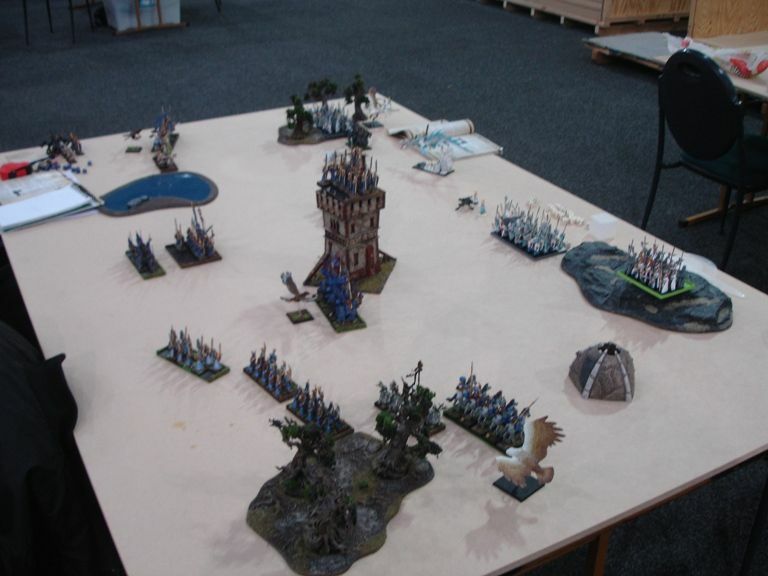 This time I faced another High Elves army, led by Aiden. Aiden brought a unique army and I was very curious how this particular "pillow fight" is going to turn out. 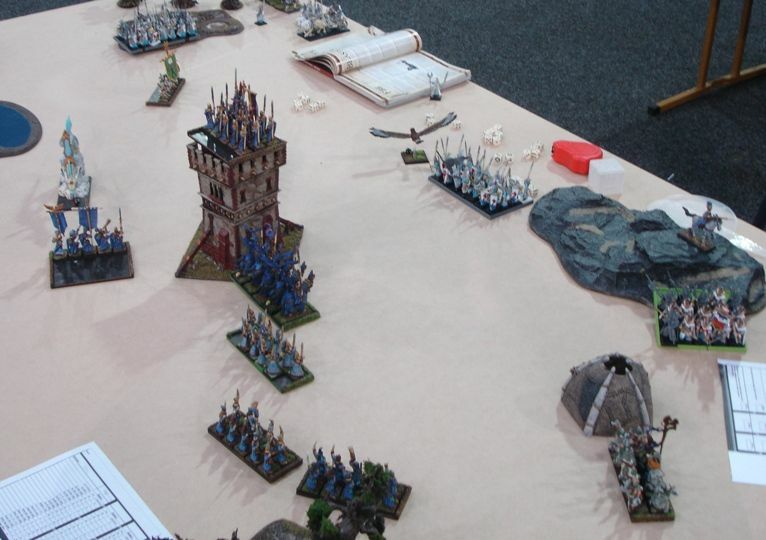 :) With our main advantage cancelled out it is always an interesting game and somehow commanders of other forces cheered up when they found out that two High Elf generals face each other. 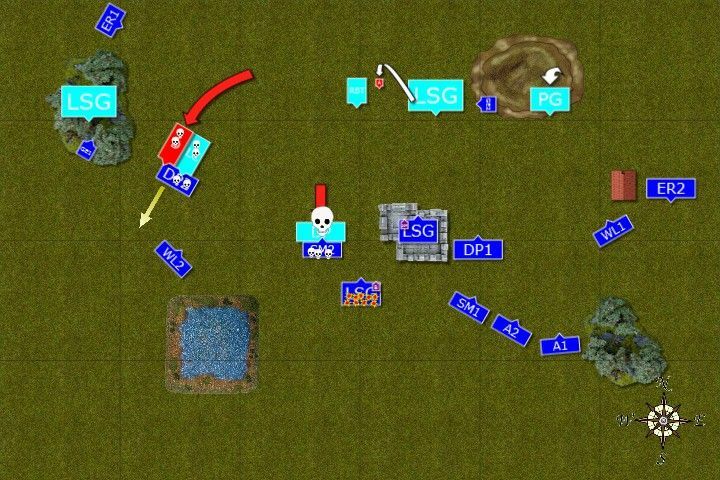 More compact army with fewer units but with advantage in the shooting department, especially when you add Fire Magic. Aiden's magic superiority also was his asset. Dragon Mage could also be a problem as it is still T6 flying monster, although I could use the fact it has only 5+ armor save. 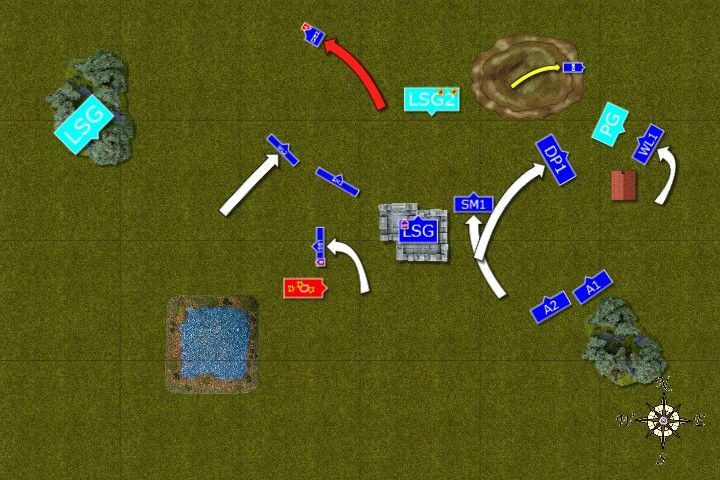 With more regiments I wanted to take down his Bolt Throwers as quickly as possible to reduce his fire power (especially dangerous to my cavalry) and try to surround his units with mine so that sheer number of attacks should give me the advantage in combat, especially that we cannot benefit from ASF. Outcasts moved forward. Some of the units, arriving little late, had to re-arrange the formation quickly. Fortunately they managed to do so swiftly and flawlessly. Archibald the Archmage ordered his Sea Guard to occupy the building and took the whole top floor for himself only. Despite a lot of movements performed by the regiments some of them still managed to shoot. Ellyrian Reavers on the West inflicted a single wound on Great Eagle while Archers, to their own surprise, peppered the Bolt Thrower so heavily that it stopped working and the crew, deeply offended, left the battlefield muttering something about not being fair. Fire Archmage became even more red at his face at such open lack of discipline. 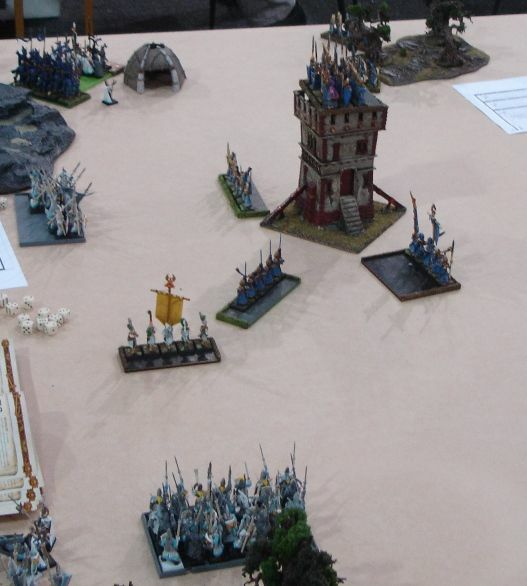 Turquoise Elves seemed to be a little confused at which unit in particular to shoot at and they dropped only a few warriors from blue regiments here and there. Dragon Mage wanted to punish Reavers for their shooting at great eagle but his magic was stopped and the fiery breath of his mount was not that hot either. Remaining Reavers didn't panic at all. Outcasts spotted some targets and decided to charge early in the battle. On the West Reavers attacked wounded eagle and finished it quickly. Dragon Princes made a long and dashing charge but they were so proud of themselves they lost focus and managed to inflict a single wound on Lion Chariot. Big cats were not happy and dragged two knights to the ground! Archibald the Archmage cast protection on Swordmasters who exposed themselves on the heavy cavalry charge while units on the Easter flank shot down second eagle. Dragon Mage spurred his mount and charged into combat to help Lion Chariot. 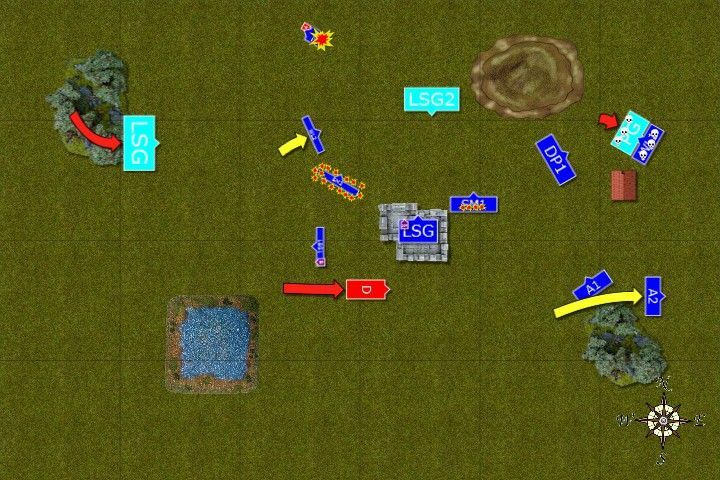 In a vicious fight, however, he lost his life as Blue Knights were determined to restore their honor. They even inflicted two more wounds on the chariot but only one of them remained after the blows were exchanged and he could not hold any longer. Young dragon went berserk and caught fleeing knight while chariot hit right into the regiments of enemy hunters. 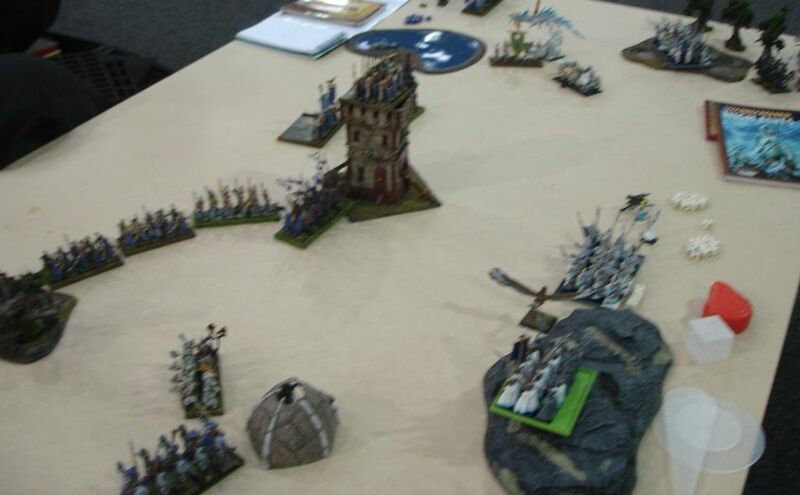 In the meantime, Turquoise knights leveled their lances and attacked enemy Swordmasters who mercilessly cut them all down and suffered only three casualties thanks to the protective aura of Shield of Saphery. Nearby Sea Guard, however, were the target of the wrath of the fire Archmage and lost many of their numbers. On the East blue regiments continued envelopment and great eagle attacked bolt thrower crew who wounded it but were destroyed soon after. 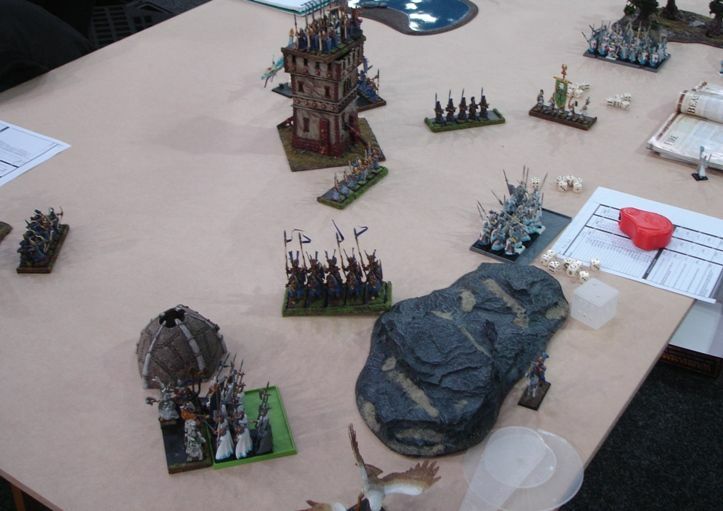 Archers, Sea Guad and Reavers all aimed at enemy infantry and inflicted considerable damage. Then Archibald the Archmage spotted something very but very strange. He looked thorough the window and as his counterpart was now on his own and away from the unit Archibald could see clearly and paled. How outrageous! How could he! It is a breach of all protocols! How could he dress up the very same, most fashionable Robes at the same battle! Archibald was so furious that he simply drew too much energy to cast some powerful spell to punish that other wizard, who displayed such lack of manners that he simply confused all of them and although in the end he managed to cast Curse on the dragon (clearly he was picking targets at random now) he promptly forgot all but one spell. But he didn't despair as he found out that the only spell left was the one to rob the other wizard from his Robes! "Archie, you sissy" thought Bob the Battle Standard Bearer when he heard a little explosion and a cry of rage coming from the top floor of the nearby building. Then he aimed his bow at the dragon to attract its attention and one of his magical arrows hurt the beast who turned his way. Now the fun will begin! 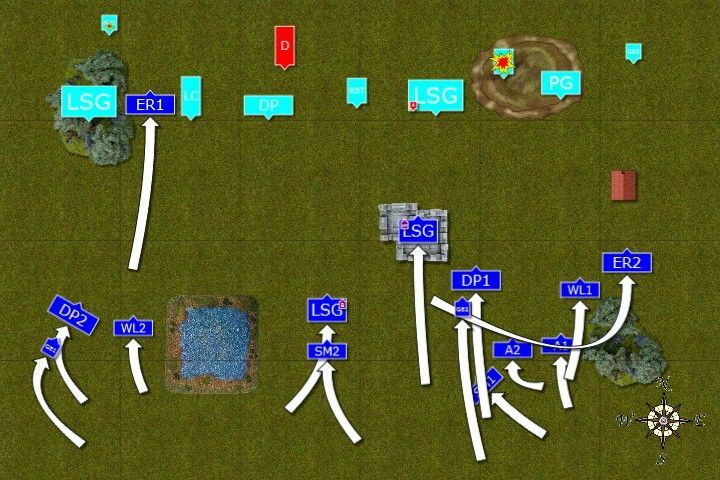 Sea Guard on the Western flank destroys light cavalry blocking their way and reform to face the center. Dragon flies towards the first possible target to avenge his master. 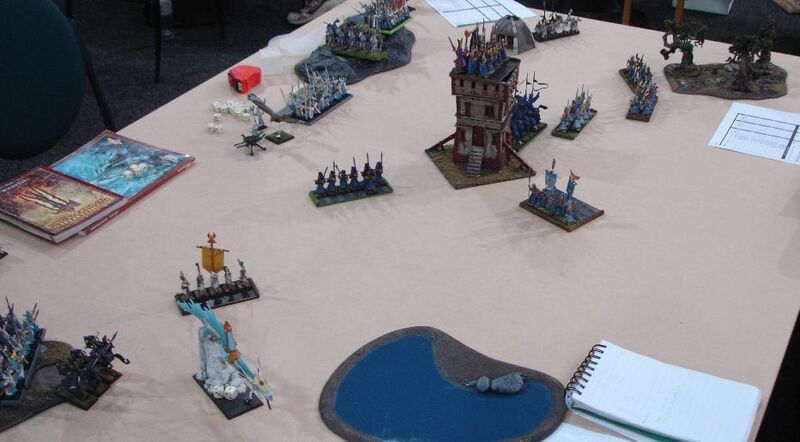 Fire Archmage manages to trap Swordmasters in the flaming cage and stop their advance to give more time to shoot for second regiment of Sea Guard. He also casts a fireball at incoming light horse and 4 of reavers burn to death, the only survivor deciding to flee the battle. 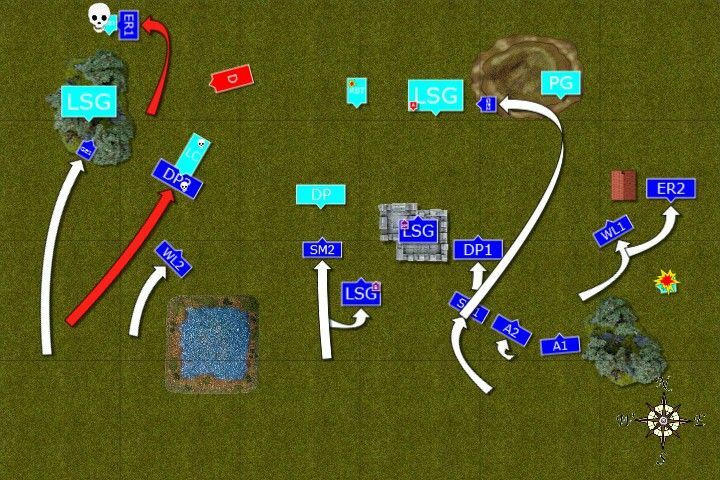 On the Western flank White Lions march towards Phoenix Guard to pin them down while heavy cavalry sped up to prepare devastating rear counter-charge. 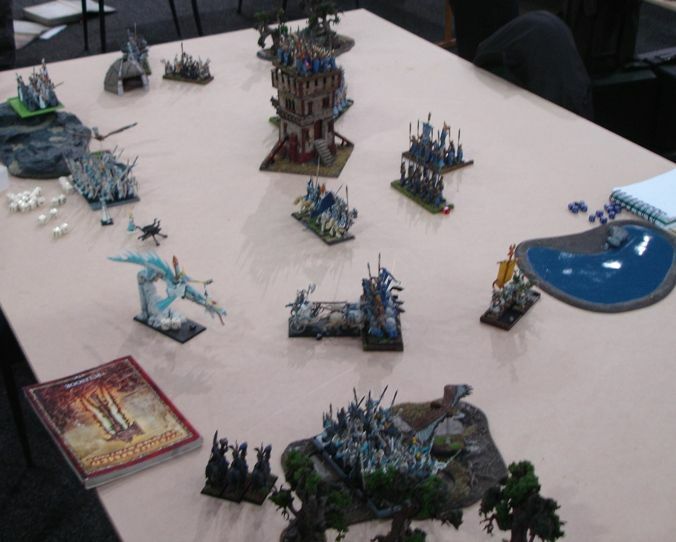 Swordmasters closed in to be ready for a combined attack against Seaguard while great eagle attacked fire Archmage to keep him busy so that he stops casting fireballs. 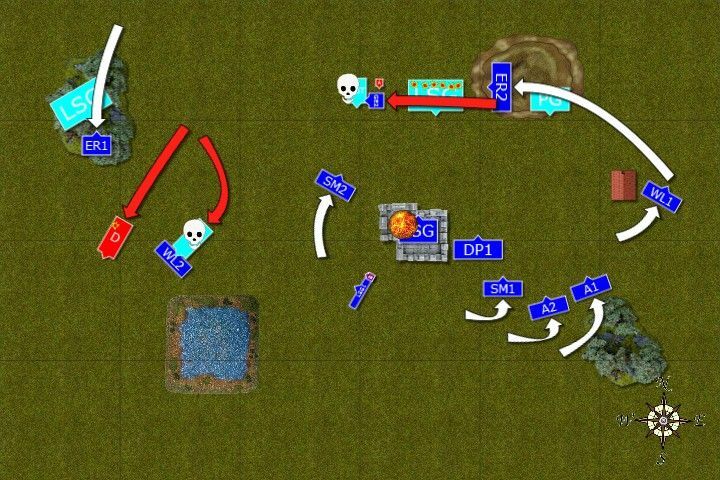 Archers and Sea Guard in the building aimed at enemy infantry but managed to kill only 2 enemy warriors. "Pansies" thought Bob the Battle Standard Bearer and urged his 4 remaining companions to aim at the dragon flying towards their lines. And they inflicted not 2, not 4 but exactly 3 more wounds and 3 was the number of wounds the beast suffered. 3 was the precise number as 5 was out of question, if it were 5 the beast would be dead after all. A lot happens on the Eastern front! 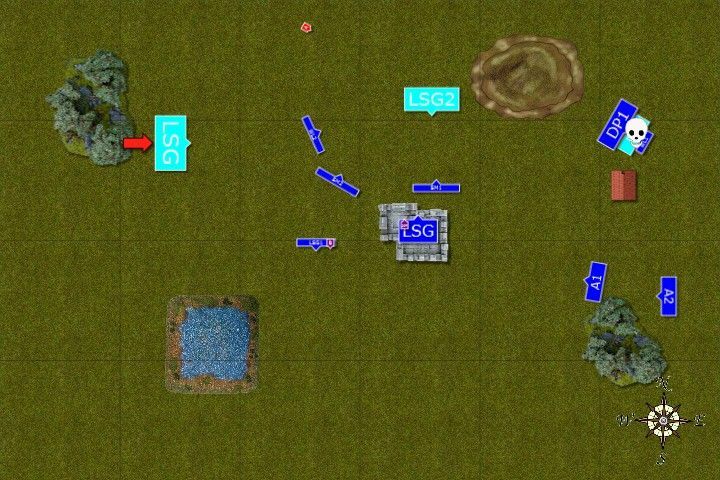 Turquoise try to counter attack but Sea Guard and Dragon cannot reach their enemies who elected to withdraw rather than stand and fight. Only Phoenix Guard gets into combat but the enemy White Lions stubbornly held with the aid of their gleaming standard. Fire Archmage had to summon his powers to try and save his warriors. He again caged enemy Swordmasters while his Fiery Cloak was deadly to the attacking eagle. 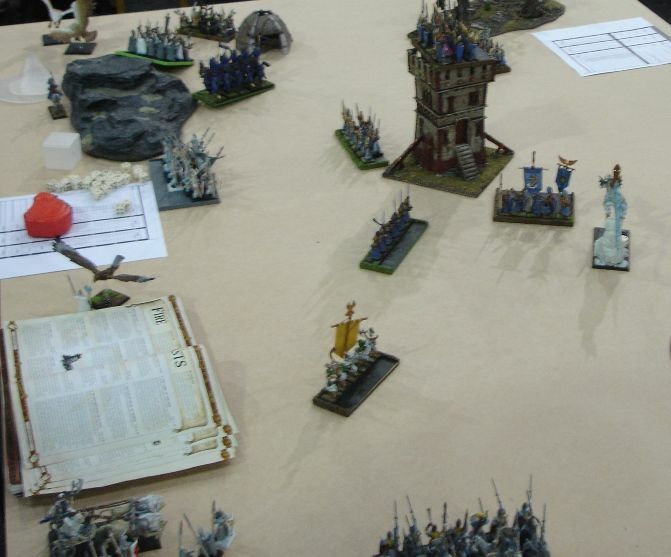 Dragon Princes charge the Phoenix Guard but silent warriors refuse to give ground either. 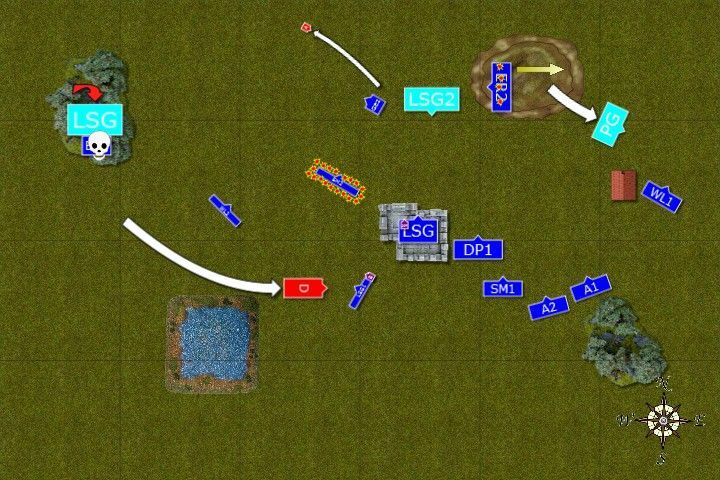 Depleted Swordmasters of a blue army stays out of combat as the enemy infantry is still too strong for them to attack, especially alone. 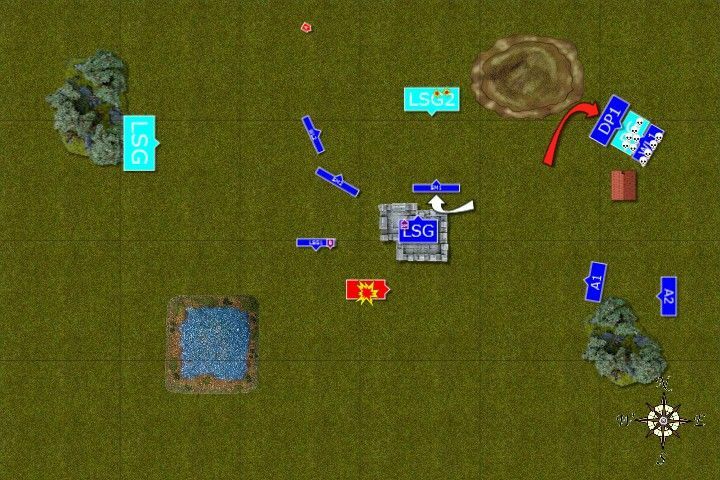 Bow armed warriors try to inflict enough casualties to break the resolve of the enemy sea guard but they fail. 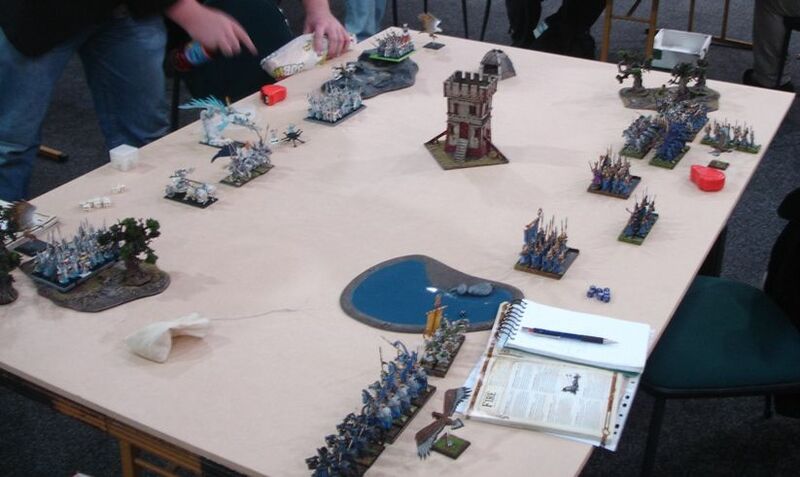 Bob the Battle Standard Bearer didn't even pay attention as he carefully aimed at wounded dragon and killed the mighty beast ending its suffering. 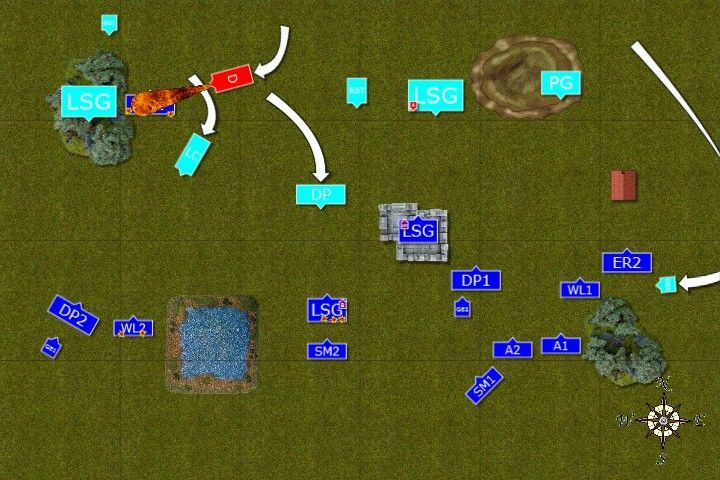 In the last attempt to change the course of the battle Turquoise sea guard tried long charge but didn't make it. Somehow fire archmage was too tired to cast any more spells and when Phoenix Guard finally broke from combat he decided to withdraw his last two regiments from the battle. Another lucky victory! 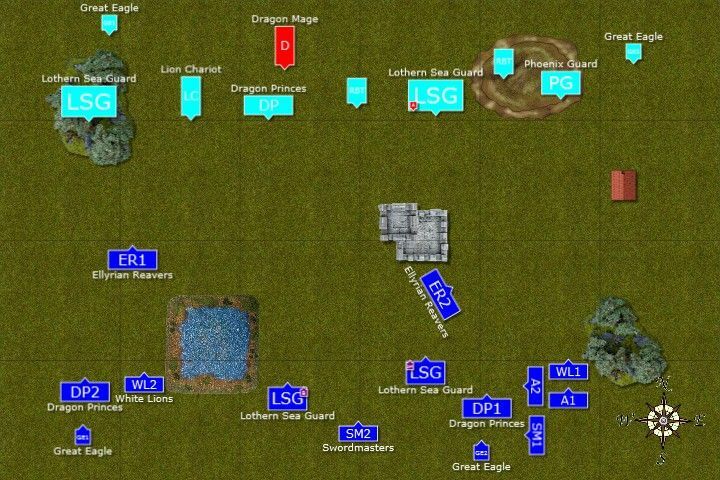 Lucky as I didn't expect to shoot down the dragon and Phoenix Guard was taking that break test on ld 8 so they had good odds to stay in combat and deny me points. Fire magic was very dangerous and only because not all the spells were cast against single unit I managed to keep some of them intact by the end of the game. The Cage, however, prevented me from charging Sea Guard who could stand-and-shoot and were still in 3 ranks to cause trouble for Swordmasters. Especially for single unit. It was also a great thing to see Dragon Mage and a pity he didn't survive for long but if he did I am sure I would have suffered much more from the magic as his free power dice for spell casting was really handy. Last but not least I wanted to thank Aiden for a great game, I hope he enjoyed it despite some bad luck at the end when he lost 2 of his very expensive units.